Quoting Professor James Tanner: “Reflected in the patterns of growth of human populations are the material and moral Santiago Atitlan is one of the Maya towns on the shores of Lake Atitlan and it is the centre of the Tzutujil Maya. The history of Santiago Atitlan dates back to around 900 AD when the Tzutuhil tribes settled in the area after the collapse of Maya state society in the lowlands. 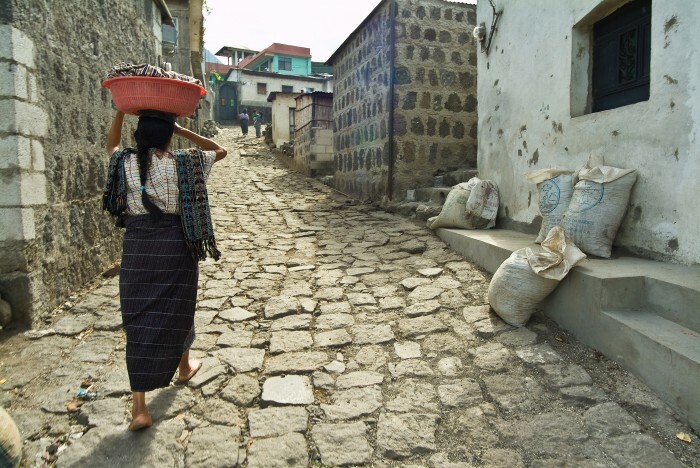 In modern times, like many Maya villages, Santiago Atitlan has been exposed to the violence of armed conflict and the tragedy of natural disasters. In 1979, the Guatemalan army set up a small base in the town and young soldiers from different parts of the country began to arrive there. The base was set up in response to rebel, guerrilla activity in the surrounding area. The soldiers walked around and behaved as if they owned the town… and in their minds, they did. As a result, they were not welcomed by the local community. In one particular incident, someone shooting ducks around the lake was mistaken as a guerrilla attacker. As a result, a truckload of soldiers opened fire on bystanders killing nineteen of them including the duck hunter. After this incident many local residents decided to seek exile in the refugee camps of Mexico. Even so, abuse by the soldiers of the local community carried on for many years. On 2nd December 1990, the base commander made a move on one of the local young ladies. The commander, who had been drinking and partying, went knocking on the door of her home at midnight. The girl’s family were very scared and cried for help! A group of local residents heard their cries, seized the commander and took him to the local jail. Once word of the situation reached the base, a patrol was dispatched to investigate. As they arrived at the village they were met by a group of angry local residents. A dispute followed and the patrol opened fire injuring a 13-year-old boy, leaving him paralyzed from the waist down. The church bells were rung to raise the community and by 01:00am in the morning around 3000 people had gathered and marched to the base demanding justice and requesting the commander to be handed to the authorities. The situation became very tense and the angry crowd started throwing stones at the soldiers. In response, the soldiers opened fire killing 14 residents. As a result of this dreadful situation and loss of life the President of the Republic of Guatemala ordered the army out of Santiago Atitlan, never to return. This was not the end of the tragedies in Santiago Atitlan. On October 4th 2005, Hurricane Stan hit the area. Constant rains caused a major mudslide burying an area called Canton Panabaj. A thousand of its inhabitants were killed. Read more about the massacre in Santiago Atitlan.